There are several posts on TFL for bread with cranberries but there are almost no posts using tarragon and nothing about a combination of tarragon and cranberries. In Slovenia, where I live, one of very popular national dishes (cakes) is tarragon cake ( in Slovenian language “pehtranova potica” ). In this cake, which is made for different holidays, we mostly use fresh (green) tarragon. “Potica” is made from dough typical for Italian panettone. The dough is spread after bulk rise and topped with a mixture of fresh tarragon, young or cottage cheese, crème fraiche or something like this with some sugar added. Then everything is usually rolled together and put in a typical model for the final raise. 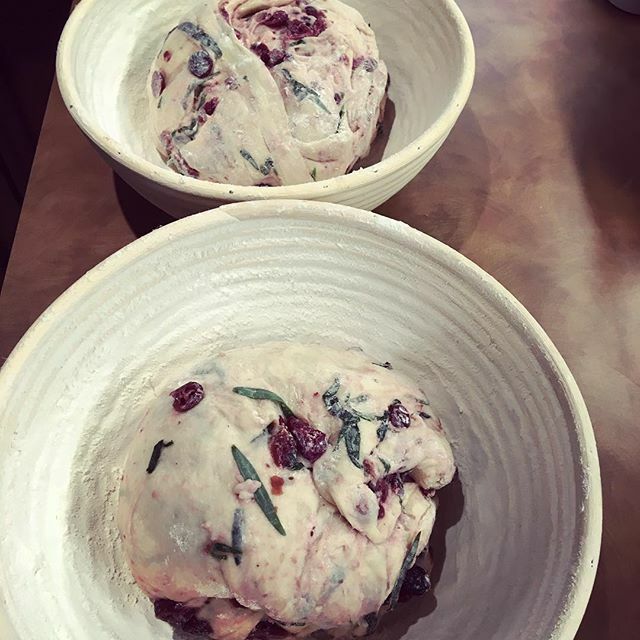 For a while I had idea to combine cranberries and tarragon and make special kind of bread which would not be as sweet as a cake, but would be an ideal one for eating at breakfast topped with butter and cranberry jam or with some camembert cheese. My wife likes cranberry jam and her birthday was just a perfect occasion to put my idea in practice. The dough recipe is following the idea for a Tartine County Loaf. The additions are dried but rehydrated cranberries, chopped fresh tarragon (one can also use dried tarragon) and 2 teaspoons of honey. I used fresh tarragon from our garden. If you don’t like sweet bread you can omit completely two teaspoons of honey. The recipe calls for using milk but one can use water instead. However, be prepared that the taste in this case will be quite different. Several hours before you start mixing the dough you should soak the cranberries in the water and dry them before you put them in the dough. However, soaking them in the water will cause that a lot of their juice will be dissolved in water so it is good to use the water from the soaker for mixing the dough. Alternatively what I do is soaking cranberries in milk which is used in the recipe and strain that milk away before mixing the dough. It might happen that the milk will coagulate a little bit due to the acid in the cranberries but when you add cranberries to the dough you will not notice this at all. If you are using milk then after straining add missing quantity of milk to have 200 grams of milk for mixing the dough. Sometimes cranberries can be quite thirsty and you have to correct this by adding more milk. One can also use re-hydrated cranberries. In this case there is no need for soaker. 1.) Mix with mixer 2 eggs, butter (leave it on room temp for a while to soften), honey, about 100g of the flour and some milk to get a thick batter. Then add strained milk from cranberries, levain, rest of milk/water and rest of flour and mix with hand to get a shaggy mass and let it rest from 20-60 minutes. 2.) Add 20 grams of salt and mix thoroughly with hand. 3.) Do stretch & fold every 30 minutes. Add cranberries and tarragon one hour into bulk fermentation (at second stretch & fold). 4.) After three to four hours of bulk fermentation (watch the dough, not the hour) divide the dough and let it rest for 15-30 minutes on the bench. 5.) Do final shaping and let it rise for about 2 hours or retard immediately and bake it direct from refrigerator after 8-12 hours. 6.) Bake in Dutch oven – for 10 minutes at 240 dC (460 dF) and then reduce to 220 dC (435 dF). Open the lid after 30 minutes and bake for another 10-20 minutes. Alternatively bake with steam for 15 minutes, after that continue with convection bake. CAUTION: As this dough contains more sugar it will brown faster so it is a good idea to reduce the baking temperatures for about 10-20 degrees. 7.) Cool on a rack for at least 1 hour before slicing. Taste of this bread is really great in if you like tarragon you will love this bread. One can use dry tarragon for the recipe as well; however in this case use only 30 grams of dry tarragon. Actually the quantity of tarragon in this bread is completely arbitrary and depends on your taste. Today I was baking this bread for my mother who turned 91 and also for our neighbor who turned 61. I took several pictures which I am publishing now. My today's baking is with excellent Italian "00" flour. After slicing - crumb was very soft, not too open (this was my intention), the crust was not too strong. This bread amazes me every time I eat. I like the pairing of cranberry with something other than walnut. The colors of the combination are quite attractive in the crumb shot. And I can imagine the rich flavors the rest of the ingredients would bring to the loaf. Thanks for sharing. Your wife must be pleased! Thanks Yippee for your comment. And yes, my wife was really pleased as this bread was prepared for her 60th birthday and unfortunately at that time she had big problems with her thyroid, so this bread made her really happy. The combination of flavors is really great, especially because I am using fresh "100% organic" tarragon from our garden. Every year we produce so much of tarragon that we can freeze it and use it later during the winter for baking different kinds of breads or preparing dumplings. I am eagerly waiting for the final result. The dough looks great as it should look like so I am sure the bread will be awesome. Thanks for giving a try and happy baking! Sorry it took so long...Thank you again for sharing! Thanks for trying this bread! Congratulations for so nice result and so warm post on your blog. The outside looks slightly different than mine, probably due to different baking method, but the bread looks great. Fantastic post. Would you mind if I featured it on the homepage for a bit? Floyd, that would be fantastic and you will make me very happy! Ian, thanks for your comment. I would never have thought to combine tarragon with cranberries. What an interesting flavour combo! Thanks Danni3ll3 for your comment! I was wondering the same about the combination of flavors, so I took just a little bit of tarragon and one or two berries and tasted the combination and for me the taste was great. Actually the final result - the bread has even better flavor. However, some people "hate" that specific tarragon's flavor. Fortunately they are in minority. Next time I will try the same combination of flavors but without eggs, butter, milk and honey. Because the original recipe yields so great bread I am always reluctant to try this "reduced" combination. Here I would use the old Roman proverb "De gustibus non est disputandum!" which I have learned in the grammar school (translation: "In matters of taste, there can be no disputes"). I'm trying this out later when home on holiday, have tarragon growing like crazy in my garden as well. I wonder what a lemon grass infusion might do? Or tarragon with sweet/sour combinations like tamarind? Thanks Mini Oven for your reply. Actually I did a small search on internet on combination of tarragon and cranberries and the only thing found was a chicken salad. I don't have a lot of experience with lemon grass. I would definitely try it, but unfortunately this year I have no lemon grass in my garden. Whenever I use tarragon as a spice in any dish I always first add just a little bit of tarragon into a spoon filled with dish and taste it. If it "passes" then I add it, otherwise not. I found tarragon as very nice spice on top of baked sweat potato. Yesterday I added chopped tarragon to pancakes (crepes) and is just great and adds a very nice flavor. In May this year I was in Helsinki in Finland visiting Chef &Sommelier restaurant with 1 Michelin star. The chef is Sasu Laukkonen and he told me that for each dish they serve there must be a complete agreement among him and his 5 souz-chefs about the taste of the dish. If there is no agreement the dish is not listed in the menu. The only bread they serve in the restaurant is of course sourdough. Bottom line: one has to experiment with flavors a lot before one can reach a winning combination. Failures are usually required steps to reach the goal. Please post the results of your try. I would like to see how other bakers evaluate this bread. I will add some new pictures to my original post. That my noodles for lunch left me with a great tasting noodle water. I chopped up 4 stalks of lemon grass and tossed them in to simmer, drain. Tastes like lemon curd without all the sugar and an tiny bit salty. I'm going to halve the recipe for my mini oven and see where it goes. I wonder how much dried to use... It smells great. I have no experience with dried tarragon, but I would go with 20% - 30% of original grams value for fresh tarragon. You have to buy some cranberries, they give the distinct sweet - sour flavor which perfectly goes together with tarragon. I will just have to go find cranberries then. Tamarind is sweet sour but not red. So how much volume is 100g of chopped up fresh tarragon? I wouldn't like to speculate but if you use whole glass it will be fine, but I would use two. My neighbor makes regular Slovenian cake with tarragon uses 3 standard spice glasses, so probably 21 grams. Actually the amount is completely arbitrary - it just depends how much tarragon flavor you would like to have. I like the tarragon flavor, so I put more. Bottom line - go with one glass, two would definitely give more tarragon flavor. I am sure you will soon bake again this bread so then you can apply any required corrections in the amount of dry tarragon. OMG! Its looks amazing and will definitely try this amazing recipe thanks joc1954 for posting all detailed measurements. It is definitely worth to try, especially if you like tarragon flavor. 1. How long you wait between mixing your levain and mixing your final dough -- do you do so right away or wait a number of hours? 2. You say to watch the dough during bulk fermentation -- how large do you expect it to grow (how many times larger than it begins)? 1.) In order to get relatively open crumb your levain should be bubbly. It is hard to say how long time before mixing the dough you should prepare your levain. The biggest factor is temperature - warmer environment will cause that levain will be ready for final dough mix sooner. With most starters and room temp around 20dC (70-72dF) the leavin will be ready in about 6-8 hours. Sometimes I use levain as soon as it starts raising. A good test is that the levain should float in water. You can wait until the starter is really bubbly, about 6-8 hours, could be even 12 hours, but this depends on your starter. This recipe is not different from any other recipe regarding the levain. 2.) For this recipe I never let dough bulk ferment so long that it would rise more then 20-30% max, could be just 10-20%. If you would not do stretch & fold the dough would probably almost double, but with stretches you somehow degas it every time. You will feel that the dough is more aerated, softer, feels alive and at the edges of the vessel it will just be higher. I would suggest you that for final dough mixing you use relatively warm water/milk at about 38-39dC that the mixed dough will be 27-28dC. At this temp the dough will be ready for dividing probably in around 2.5 to 3 hours (depends if you will keep the dough at the initial temp), but again, look at the signs of dough, not just the watch. At lower temps you will need more time but at normal room temp of 22dC the bulk fermentation will be completed in 4 hours. Simply just do what you do with any other recipe. I am glad you will give a try to this bread and I am sure you will enjoy the taste especially if you like tarragon. In case of using dry tarragon you need only about 15-20g of it. 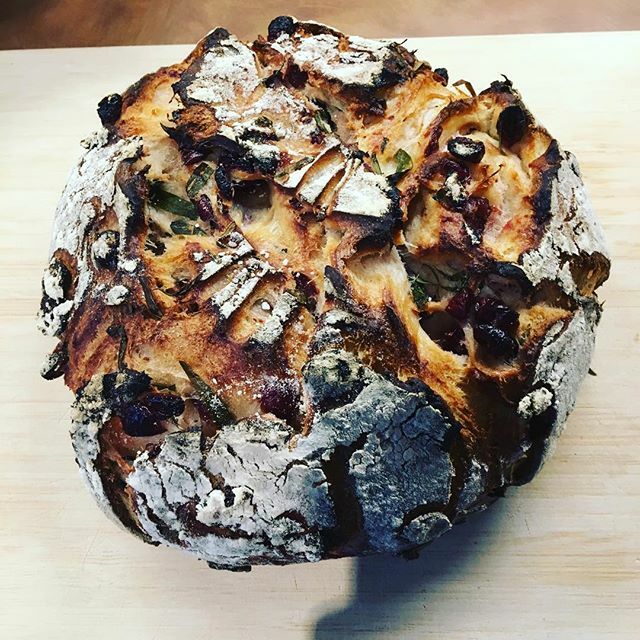 Thank you for posting your formula for tarragon and cranberry loaf. I just cut in to the loaf I baked late last night- following your clear instruction fairly closely - and it's delicious. The crumb is light and slightly sweet while the flavor is strongly tarragon - definitely a combination that appeals to me! Tarragon is something I have not baked or cooked with. It's a whole new taste experience. Next I'm going to try your recipe and swap out the cranberries for cherries and the tarragon for anise. I don't think it will be better. It's just a combination I recall from childhood and the loaf that you have shared will suit the combination nicely I think. I am really glad that you bake was successful and you like the bread. I was baking it today as well for my customers. I am trying to imagine the taste of cherries and anise. I think it will be great. Here is Slovenia a lot of people make biscuits which are sprinkled with anise seeds. 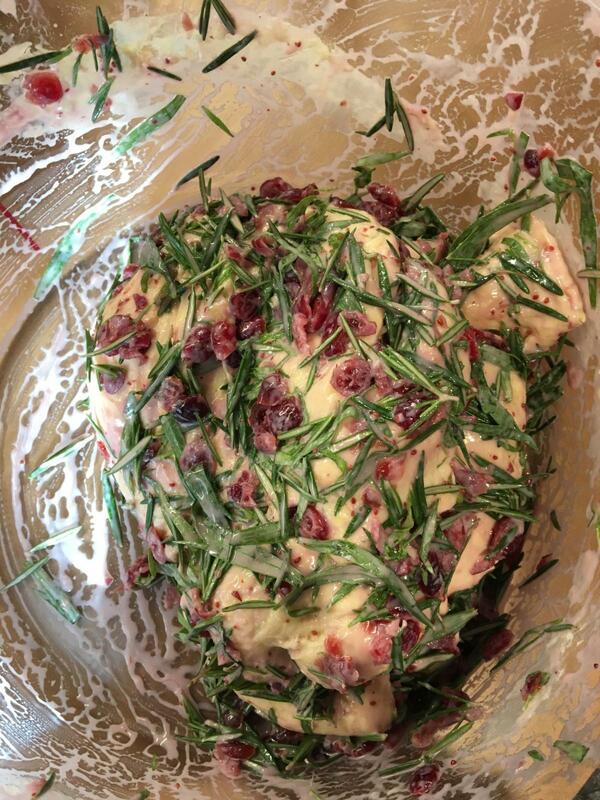 The dough for biscuits is similar to the dough for tarragon and cranberries bread. Adding cherries will just make this really very attractive. Go ahead and test it. Just be careful because anise is quite a strong spice. Hi Joze, I'm in the process of making this bread for the second time and am hoping you can help me troubleshoot. The finished product was a bit underbaked, and it didn't rise like I'm used to sourdough rising. All that said, this is the first time I've baked with honey in the dough, and I also don't have much experience using butter or milk (though I have made brioche successfully before). I'd welcome and appreciate any feedback you might offer me -- the flavors are there, and I'm hoping to also be able to achieve the beautiful textures that I see in your pictures and that I've achieved with other sourdough baking. 1.) Did you follow instructions for mixing from the recipe? 2.) Did you follow the recipe regarding the quantities of the ingredients? Looking at the pictures you have posted I would say that your dough was pretty much stiff. In my recipe I am using 50% AP flour and 50% bread flour. Actually the bread flour I can get here in Slovenia is just a stronger AP flour according to the measures in USA. From your picture it looks like that you have a very strong dough. I have no idea what kind of flour you are using but it looks to me that the dough would need more milk/water. Original hydration from recipe is only 73% what is pretty low if you use a strong bread flour. Last time I was making this bread I forgot to put levain(starter) in the initial mix and I added it later after 30 minutes of autolyse when adding salt. The result was not like I had always and the final bread was quite dense and not fluffy as it should be. This was the only time I had "problems" with this recipe. Using honey,butter or milk for baking should not change a lot the way how you usually prepare the dough. When you add milk and butter the texture of the dough is simply different - it is more silky and soft. If you think that your dough was under proofed, just extend the proofing time. If you retard the dough in the fridge the dough will be much stiffer than normal bread because it contains butter which will add more stiffness to the dough when the dough is proofed in the fridge. Therefore I suggest that for your next try you don't retard and just continue with final proofing at room temperature after shaping.The alternative would be that you leave the shaped loaf on the counter for an hour or two and then retard it. But I would definitely use the first approach in order to get well proofed loaf and have it under control. Maybe next time you can use just the AP flour with only 10 to 20% of bread flour to get softer dough and stay at 73% hydration. Definitely you have to adjust the amount of milk/water in order to get a softer dough. Hope these comments will help you and I am looking forward to get you answers.